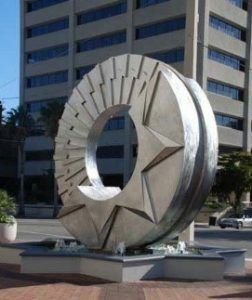 Rob Lorenson’s sculpture, Sarasota Deco, has graced the corner of Main Street and Central Avenue in downtown Sarasota, Florida since 2008. This stainless steel sculpture with water feature measures 16’ x 16’ x 5’ and is owned by the developer. The placement of this sculpture at Five Points, the intersection of Main Street, Pineapple Ave, and Central Ave, also has historical significance. In 1885 the Florida Mortgage and Banking Company platted Sarasota from the center of Five Points. Since 1986, the City of Sarasota’s Community Redevelopment Plan requires, “Any property owner or developer who applies to the City for a Building Permit to construct or make improvements that exceed $250,000.00 in construction value… shall be required to make a public art contribution.” Depending on the value of the construction, the developer can chose to either make a contribution to the Public Art Fund or provide public art.